I am a family practice doctor and have been working out with Tim McAuliffe. Most of my adult life I have done some type of physical activity, but I have never met a trainer with the experience and knowledge that Tim has. 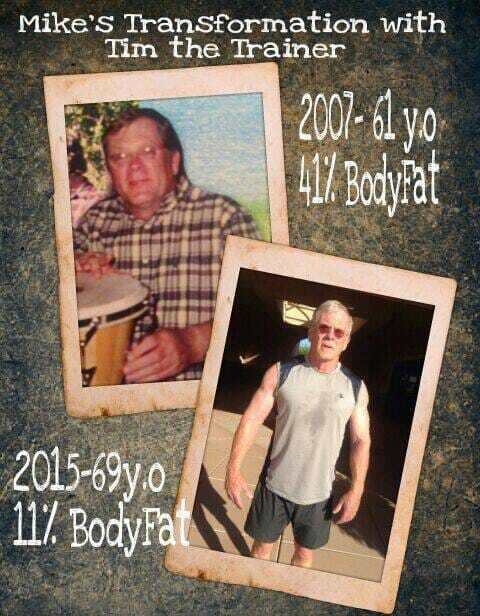 He is an expert on nutrition and training and knows how to get results . . . and he does it all with natural supplements and diet, along with his unique style of training. At 56 years old, I feel better than I ever have in my life. I have tons of energy and strength. My low back pain is greatly diminished and my skin looks like I’m twenty years younger. I entered my first figure competition with a 7% body fat after working with Tim for only four months. Don’t be fooled by thinking your doctor has all the answers. If he or she is not walking the walk, they likely don’t know how! Tim McAuliffe is the real deal! Even after 12 years of schooling and residency, he has taught me so much about nutrition, supplements and training. If you want to take your life back and live to your optimum potential, call Tim today!! J.P., D.O. As a 16-year-old wrestler, I am very pleased to be working out with Tim. He has an impressive personal background in this sport and has focused my training sessions to help me become stronger and more explosive. I know he does not use a cookie-cutter approach to training but really gives each session thought and consideration. I’ve gained a lot of insight as well as muscle and look forward to continuing my sessions with him! R.K. SEND ME A FREE AB WORKOUT! We can honestly say that Tim is the best and most challenging trainer we’ve ever had! Our family has worked with other trainers in the past, both in large gyms and smaller personal training facilities, but he surpasses them all. Tim is not only knowledgeable but thoughtful and patient and knows how to encourage each client to push just a little further than they thought they could to achieve their individual goals. He has really made a difference in Lindsay’s confidence (age 16) as well as influencing her eating habits and pointing her toward a healthy lifestyle that she will have forever. Vickie definitely manages her health and stress challenges better because of Tim’s input. V.K and L.K. I’ve been training with Tim for a few years. My right shoulder was injured and I’m naturally tight. These conditions affected my upper body development. Tim recognized my situation immediately, because of his years of experience. Tim brought me along slowly, which included proper warmup time and stretching. The shoulder healed, but I’ll always be tight. I’m making great progress. My shoulders are looking great and my chest is coming along. Tim has combined weights with cardio making me much stronger and fit. Old school methods are used along with new techniques to accomplish this. I’m more fit now than I’ve ever been. Tim’s counseling in good nutrition, needed supplements, and vigorous training 4 days per week makes this possible. By the way, I just turned 65 years young. M.K. Tim is an amazing trainer, but most importantly, he is an amazing human being! He is extremely caring and genuine and this is what makes him different from other trainers. My two children (Tiffany 8 and Alex 10) have been training with Tim for a couple of months now, and they love it! His fun workouts and positive attitude keep the kids so motivated that they don’t mind waking up at 6:30am on Saturdays to go workout, to me that’s very impressive!!! Inspiration is hard to come by, and you by far are an inspiration to us all. Thank you Tim. A.L. I first met Tim when he worked at another facility. We did 1 on 1 training to get my muffin top in shape. The 1 on 1 training I received was very much individualized. Tim realized that because I was carrying quite a bit of excess weight, I moved a bit slower than probably most of his clients. None the less, he was patient, all the while pushing me to my greatest potential. His training not only helped me physically, it helped me mentally as well. I look forward to working with Tim again in the future. I would recommend Tim to anyone looking to rid themselves of a few extra pounds. Also, it helps to follow his nutritional plan as well. I came up short in that dept. N.E. Coach Tim has been such a blessing for our whole family. He is so dedicated to helping people. It is his life and it shows. He is working with my three boys on conditioning. They love it and want to go more than two days a week. I would tell anyone who wants to change their life and learn how to live a healthy lifestyle to contact Tim the trainer/coach. G.C. I have worked with Tim for four months. I am 50+ years old and have lived a extremely active life that had taken its toll on my body. I was losing my strength and flexibility and my joints etc were aching everywhere. After four months of training and changing my exercise routine, diet and nutrition I am now doing things I could barely do 20-30 years ago. I have changed my life so that I am virtually pain free, have regained my strength and flexibility all through natural means. Thank you Tim! M.F. Tim is without exception an elite personal trainer, who has spent his entire life dedicated to health and fitness. His expertise in conditioning training is unmatched in the Phoenix and Chandler areas. R. L.
I WANT A FREE AB WORKOUT!